A pretty lousy cartoon meets real world movie trying to imitate who framed roger rabbit and not getting very far. 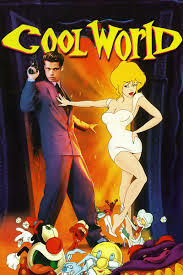 Cool World is a movie about an author who draws comic book animations, and then learns that his drawings are real. That is what the trailer would have you believe it is about anyway. I remember seeing the trailer for this movie when I was young, and it made the movie look like it was about a guy who was obsessed with one of his cartoon drawings of a woman. He was in love with this character, and then one day stepped into her world. Turns out the movie are only partially about that. Maybe even less than half. That is because for the first portion of the film, we do not even meet that artist (played by Gabriel Byrne). Instead, we are with a young war veteran returning home to his mother. The war vet, named Frank Harris, is played by none other than Brad Pitt, and it is the forties. Harries shows his mother his new motorcycle and even convinces her to go for a ride on it with him. While they are out riding, a drunken couple is also driving around the desert in their convertible. The motorcycle and convertible collide and there is a deadly accident. Frank’s mother dies, and Frank is left there, on the ground. That is when he is somehow transported into the cool world. So far, at this point, the movie has been good. It is less than ten minutes in, but it has been interesting nonetheless. There are small flaws to be sure, such as that maybe the mom shouldn’t have died and instead frank could have been transported into the world the second that the collision happened. That would make him want to get back to the real world to see if his mother survived. Another cool idea might have had jack thrown from his bike, off a cliff, and while he was flying through the air, on his way down some sort of massive open canyon, he was sucked through a wormhole into the cool world. That would mean that the invisible wormhole was actually hanging there in the middle of the cliff, a place where whoever put it there, thought nobody would ever go. Whatever fun or interesting ideas have been started by the first few minutes come to a crashing halt once frank enters the cool world. The characters he meets there, starting with doc whiskers, are annoying as hell. In addition, none of them are very much fun. Frank walks around meeting character after character, and time goes by. Soon, we come to present day where we do finally meet that artist. Jack Deeps (Byrne) is a cartoonist in jail, drawing images of his femme fatale, holly would. She is voiced by Kim Bassigner, and is practically a direct copy of Jessica Rabbit, save for having blonde hair instead of red. 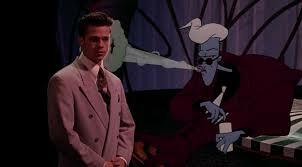 Jack comes into cool world and meets his love interest in person. At this point Frank has become a detective and is carrying on a relationship with a cartoon woman of his own. Jack and Holly would fall for each other, but frank is determined to make sure the two of them do not sleep with each other. Apparently, it is a rule of cool world that no cartoon can sleep with a real human. Naturally, Jack and Holly do sleep with each other, which sends them back into the real world. Now, for the first time, since the motorcycle beginning, the movie has become somewhat interesting. Watching Holly interact as the real world, when she is a cartoon character trapped in a human’s body, is kind of fun. However, that only lasts so long. After that, the movie becomes about trying to get characters back into Cool World and just starts feeling repetitive. The movie does not have a lot going on in terms of plot and that is a problem. It was directed by Ralph Bakshi, an artist filmmaker who’s previous credits were all animated movies. Films like wizards and the lord of the rings animated film. Bakshi is out of his element here. He is a cartoonist, but not a movie director, and it shows. The storyline is weak, and the movie comes off as an excuse to combine bakshi’s art with a live action film. It is clear that this movie was hashed on the idea of Bakshi having seen Who Framed Roger Rabbit, having seen the profits that movie made (it was a mega-hit), and thinking he could do it better. He was very wrong with that assumption.